Looking for Gutter Repairers in London? Blue Sky guttering repair gutters throughout London. Our team are trained to the highest professional standard and all our London residential gutter repair services are always carried out efficiently and professionally. We repair gutters in London and surrounding areas in the London and Home counties to take care of all your guttering repair needs in London. Gutters are designed to protect the foundations of your London home by taking the rainwater away from the building. Leaking gutters can cause serious problems in the structure of your home and can intesify health problems due to mould growth. Blue Sky Guttering repair all types of residential and commercial property. We will ensure very competitive pricing and the very highest standards of repair for your guttering repair, gully repair and downpipe repair in all areas of London in the London and Home counties From the information you supply we can give residential customers in London an instant and accurate fixed price for gutter repairs by email. Our charges are very competitive and exceptionally good value for money. The price you are quoted is the price you will pay, there are no other hidden charges. Blue Sky Guttering offer gutter repairs services in and around London. From the information you supply we can give residential customers an instant and accurate fixed price for gutter repairs by email. 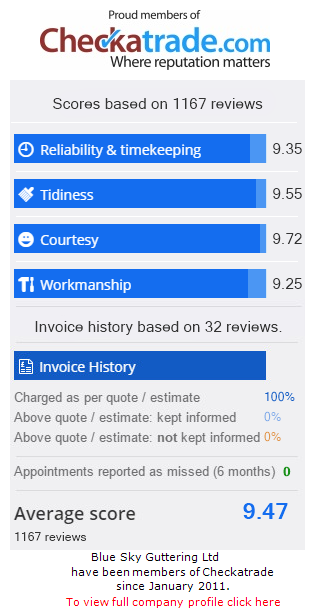 We have been Checkatrade members since January 2011 and have received over 750 customer feedback reports with an average score of 9.8 out of 10.